We all want to maximize our daily routines to get the best results. One tool that packs a punch in a low tech, high results way: the jade roller. These little stone rollers come in quartz and jade, but Anjou Spa loves the jade for the added purification and energy clearing that jade provides. Facial rollers are a product that is on trend at the moment – and for good reason! They are multitaskers for your skin care routine, touting plenty of benefits and addressing many skin concerns in one fell swoop. 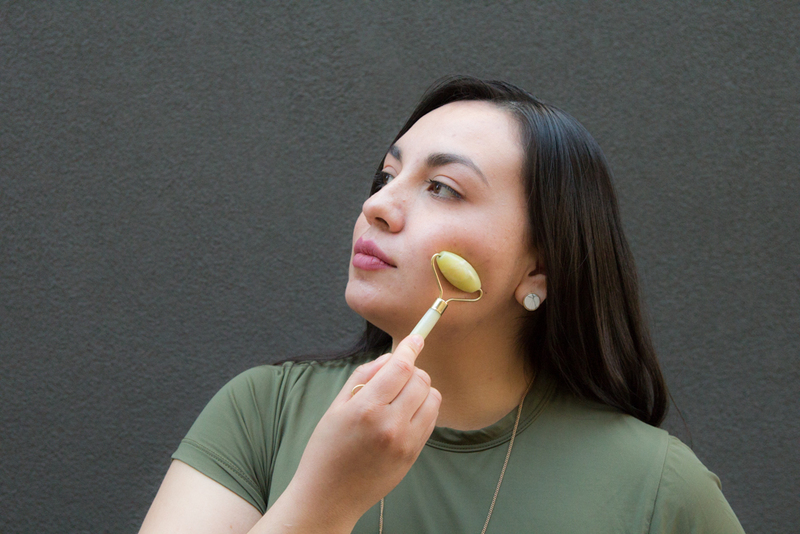 Using a jade roller is effective at reducing puffiness in the face and product absorption. That means you can refresh your face and really get that serum absorbed into your skin, making it more effective. They also help reduce wrinkles, plump areas that should be plumped (cheekbones) and encourage drainage and depuffing in other areas (under eyes, neck and forehead). Start with a cleansed face, applying a serum or facial oil if you want to, but you can also just roll on a blank canvas. Roll up with the large end of the roller, starting at the base of your neck, and following the arrows in the graphic below, go in an upward and outward direction. On your forehead, start at the midpoint and roll outward in each direction. It’s helpful to start on the left or right side of your face, then do the other side. Don’t forget the eyes! Using the small end of your facial roller, roll gently outwards on your under eye and lid areas. Once you’ve rolled up and out all over your face, start rolling down. This will encourage lymphatic drainage and help to decrease puffiness. Start at the forehead and roll out and down toward temples, then down and out along cheeks and towards jawline. Roll downwards on your neck. Finish with a little squeeze with your hand at the lymph nodes. Squeeze at the base of your neck on each side, and under each armpit. This will further encourage drainage. Basically, you’ve directed everything to drain to your lymph nodes, and now you need to help the lymph nodes to let go of the excess fluid. After using a roller, your face will look glowing and feel refreshed Your moisturizer, facial oil or serum will also have deeply penetrated your skin. After using your jade facial roller, wipe each roller end with a dry cloth and store in the cloth bag. Once a week, rinse with water and a gentle soap and dry. 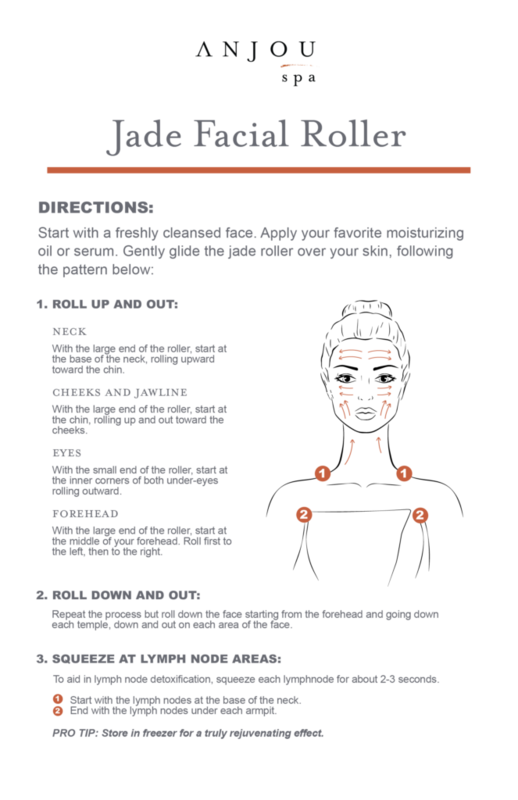 Sheet masks: Using a roller to apply a sheet mask, and after mask application, increases the effectiveness of the mask and helps further product absorption. Acne: If you are struggling with blemishes (which are another way inflammation rears its ugly head) incorporating a facial roller into your daily routine can calm and combat breakouts. Along with that added benefit of helping product absorption (i.e. any acne topical creams or serums) using a chilled roller will help your skin feel cool and calm. Chill it down: Store your facial roller in the fridge or freezer for extra depuffing powers and a refreshing way to start your day. Use Anjou Spa as your daytime escape! Call us at (541) 241-8454 or book online to schedule your next self-care treatment. Read more about Anjou Bend Spa Membership and sign up to receive exclusive member specials and samples.